Fall fruits are at their peak and there’s nothing better than buttery pears — slightly floral with subtle citrus notes, delicate on your tongue, and overflowing with sweet juiciness. 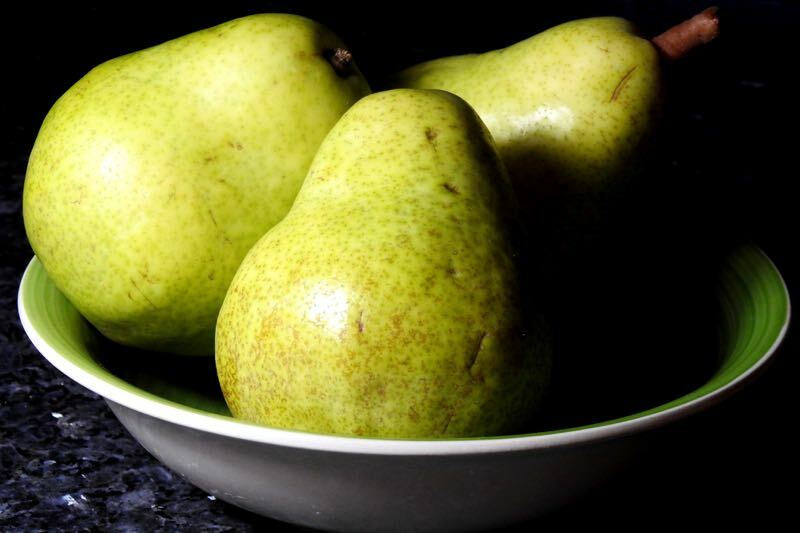 I have a trio of pear recipes — for salad, soup, and dessert — that will showcase this most versatile fruit. First, our salad course. 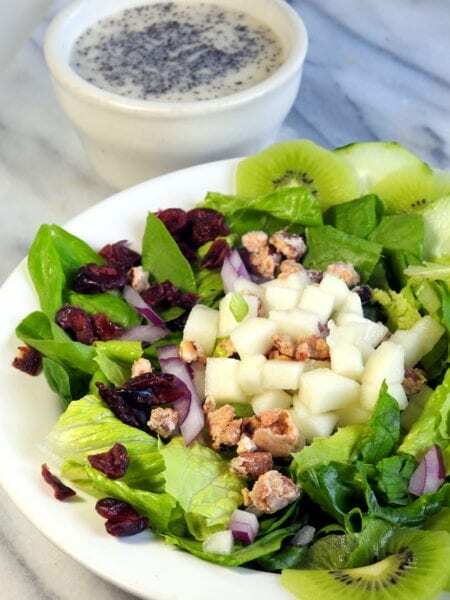 This sweet, slightly tangy and creamy dressing pairs perfectly with the salad ingredients – leafy greens, fresh fruits, and candied nuts. Arrange salad ingredients on plates. Pour dressing over top. In small saucepan, combine water and sugar. Cook over medium heat, stirring, to dissolve sugar. Bring to boil, then stir in nuts. Spread nuts in single layer on baking sheet covered with parchment paper. Lightly sprinkle with sea salt. Bake at 300° for about 25 minutes, shaking the pan every 5 minutes or so. Let cool. Combine first seven ingredients, stirring together. Slowly whisk in oil to form an emulsion. Core and peel pear, coarsely chop, and then purée. Add to dressing and stir in poppy seeds until well combined. Two fall favorites — pears and butternut squash — merge flavors to create this cozy and comforting soup, which tastes like fall. I like the addition of homemade crème fraîche to this soup. Crème fraîche is the richer, sharper, more complex, and slightly tart and nutty cousin of sour cream and it has the added advantage of not curdling when added to hot dishes. Halve squash, remove seeds, lightly oil, and place on baking sheet, cut-side down. Bake at 400° until tender, about one hour. Cool. Scoop out flesh. Heat butter or oil over medium heat and add onion, carrot, and celery. Cook for 3 minutes. Add in cooked squash and 3 cups vegetable stock. Cook at bare simmer for 15 minutes. Stir in pears and heat through. Purée mixture with immersion blender. If using a mixer, purée in batches, not all at once. Season with salt, to taste. Mix all together, cover, and leave at room temperature overnight to thicken. After using, cover and refrigerate. Will keep about 2 weeks. To add the crème fraîche to my soup, I wanted design swirls. I used a squeeze bottle to squirt a small crème fraîche filled circle in the center, then drew concentric circles around it. Next, I drew a toothpick from center to outside at quarters, then from outside to center in between the quarters. And no, I don’t think Starbucks will be hiring me as a barista anytime soon. 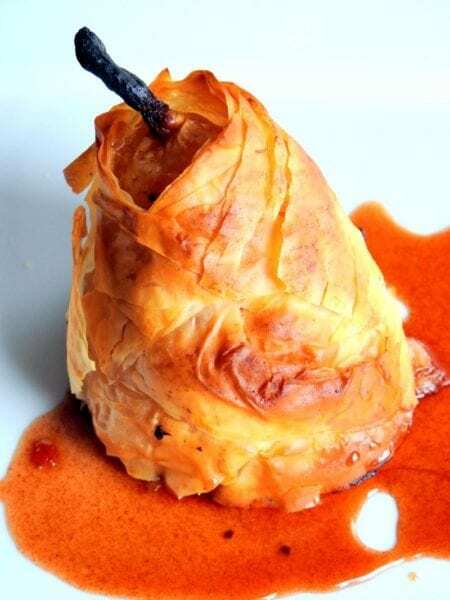 Lastly, I have a lush pear dessert for you which truly showcases this autumn fruit – poached pears, redolent with the flavors of fall, encased in a cocoon of phyllo dough. You get a soft pear slush, the crackle of phyllo, and a creamy, nutty center, all napped in spicy, syrupy goodness. It’s unpearalleled! Core pears from the bottom, leaving stems intact, then peel. Place in medium saucepan and cover with water and juice of one lemon. Add lemon peel and rest of ingredients. Bring mixture to boil. Reduce to simmer and cook pears 10-15 minutes. Remove pears and continue cooking liquid over low heat at a bare simmer until liquid is reduced by half. Spoon mixture into cored pears, pressing to fill. Let phyllo sheets thaw, then cut into ½-inch wide strips. Melt ½ stick unsalted butter. Working with 2-3 phyllo strips at a time, brush with melted butter and begin wrapping, starting at bottom of pear to enclose filling. Keep brushing and wrapping until entire pear is enclosed with phyllo strips, 6-8 strips thick. Place pears on baking sheet and bake in a 400° oven for about 40 minutes, rotating halfway through, until phyllo is a lovely golden and crackly brown. Cover tops with foil if necessary. To serve, spoon some of the reduced sauce over pears. You’ll no doubt have some of the reduced syrup leftover and I know just how to use it. Add it to Pear Sauce. The syrup gives the sauce a nice kick. It’s delightful on toast, waffles, biscuits, even heated up over ice cream. 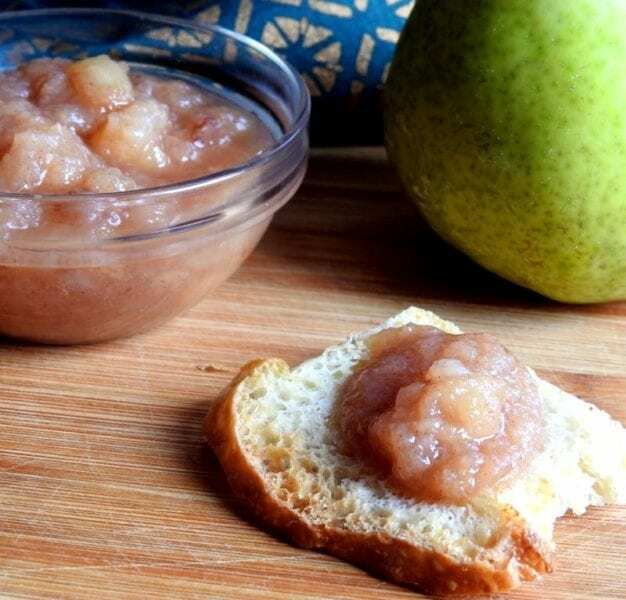 Also, pear sauce is a great way to use up pears that are overly ripe. Combine pears, lemon juice, and corn syrup in a small saucepan. Note that you’re not limited to simply pears here. If you have peaches and/or apples, feel free to add those to the mix. If you do, add in a little more lemon juice and corn syrup accordingly. Cook over low heat about 30 minutes, stirring occasionally and breaking up the chunks, until mixture has thickened and reached the consistency you like. Stir in 1 TB of the reduced pear syrup. Living where we do, we always have shrimp on hand — usually at least 20 pounds frozen at any time, so a shrimp meal is only a thaw away. Today, I have three shrimp dishes for you with distinct flavor profiles. 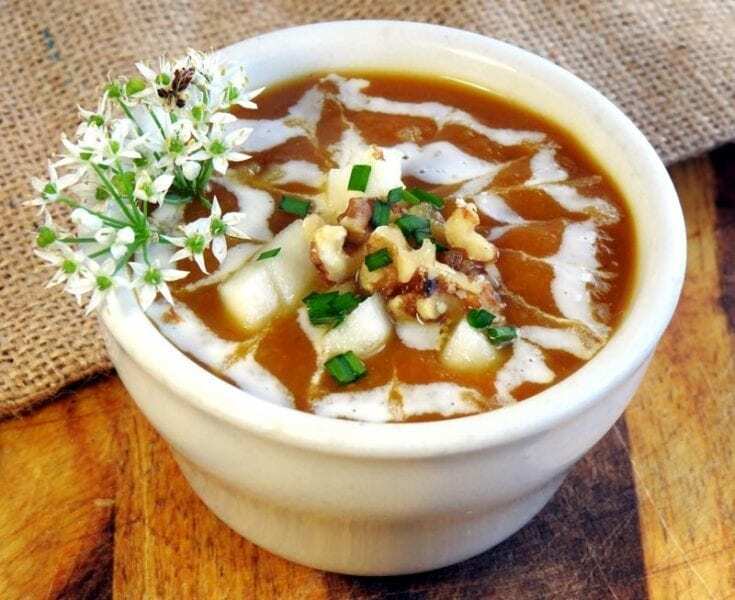 This versatile root vegetable is a fundamental southern food, finding itself on many a menu throughout the state and walking the diverse flavor profile line between sweet and savory. In culinary terms, “a la Caprese” denotes a preparation of some of the most notable ingredients in Italian cuisine – tomatoes, fresh mozzarella, and basil, which, not coincidentally, represent the colors of the Italian flag.